Sales Management -Conduct a multitude of sales calculations including calculations by product (items, departments and groups), time and clerk. An optional cash drawer can be added to operate the VX-100 as a cash register. Customer Relationship Management - Build a customer database associated with sales management data. Analyze the purchase frequency and monetary amounts for each customer, in order to identify create a list of preferred customers. Operators can send emails to a list of preferred customers who have agreed to receive them, or they can specify automatic discounts when ringing up bills for preferred customers, all associated with the sales management application. Reservation Management - Take various kinds of orders and reservations from customers, including reservations for meals. Use the customer relationship management and sales management applications to manage databases’ of customer names and reservation details including names, number of persons and time, all from the VX-100. Remote Control By E-mail - Receive e-mail messages from a cellular phone or computer, and automatically execute instructions contained in the messages. Even check sales data from a separate location, an ideal feature for busy business managers. LONDON, October 21, 2011 – Casio Computer Co. Ltd., today announced the release of the stylishly designed VX-100 business support terminal. Customer relationship management, reservation management and sales management applications will be available on this terminal. Associated with those applications, the terminal provides business operators with a variety of data that they can use to stimulate business demand. The VX-100 business support terminal will begin shipping in December 2011. 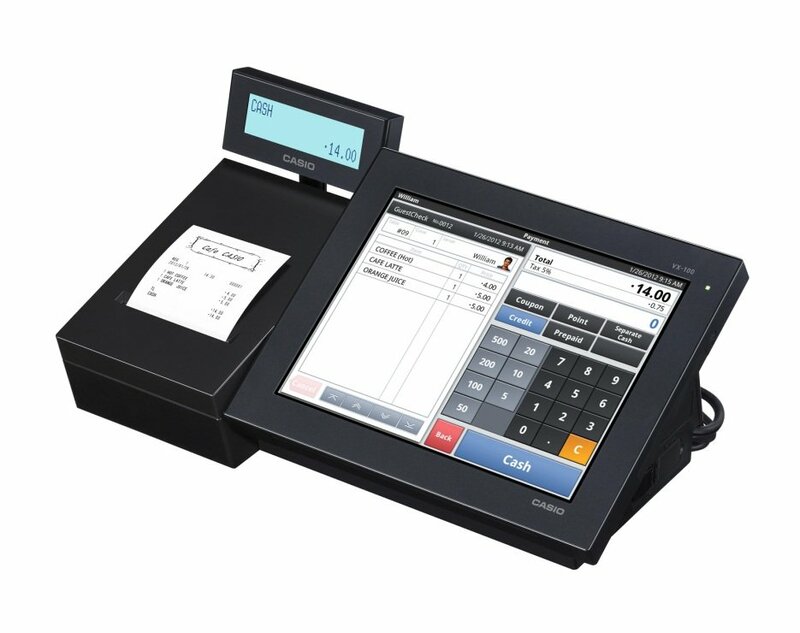 The VX-100 is a compact EPOS terminal equipped with a colour main display with full-touch screen operation, a sub-display that is great for showing information to customers, and a built-in thermal printer to generate receipts. The VX-100 is designed for use in SME retail stores, and works as both a standalone system or as part of a networked system. The VX-100 comes installed with a sales management application offering a host of data management capabilities. With the optional cash drawer, the terminal can also function as a cash register. Additional customer relationship management and reservation management applications can be installed to enable database management of the purchase history of individual customers. The purchase history can then be used to identify preferred customers and formulate marketing strategies tailored to them. The VX-100 EPOS terminal uses the Android™ operating system, and Casio has provided a software development kit that supports the VX-100 hardware. Casio plans to leverage the VX-100 to support a variety of businesses such as retail stores, restaurants and other service enterprises by developing its own additional applications as well as facilitating development of applications for the VX-100 by other developers of Android applications. Conduct a multitude of sales calculations including calculations by product (items, departments and groups), time and clerk. An optional cash drawer can be added to operate the VX-100 as a cash register. Build a customer database associated with sales management data. Analyze the purchase frequency and monetary amounts for each customer, in order to identify create a list of preferred customers. Operators can send emails to a list of preferred customers who have agreed to receive them, or they can specify automatic discounts when ringing up bills for preferred customers, all associated with the sales management application. Take various kinds of orders and reservations from customers, including reservations for meals. Use the customer relationship management and sales management applications to manage databases’ of customer names and reservation details including names, number of persons and time, all from the VX-100. Receive e-mail messages from a cellular phone or computer, and automatically execute instructions contained in the messages. Even check sales data from a separate location, an ideal feature for busy business managers. 1. Android is a trademark of Google Inc.
2. Other company and product names are generally registered trademarks or trademarks of the respective companies. Specifications in the table above are current as of October 2011, and are subject to change.